If you're looking for my Lawn Fawn post, scroll down or click HERE. 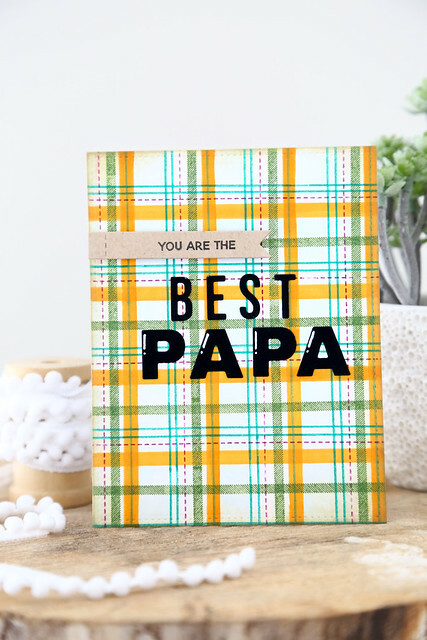 I'm thrilled to be showing off a card I made for my daddy for Father's Day. I haven't given it to him yet, so thank goodness he's not a social media kind of guy! We're waiting for the family to get together this weekend, and I think he'll love it. I used the EBE Plaid Maker set to create the background plaid - I tried my best to keep it all straight but I don't mind the little imperfections - they make it all look more handmade and whimsical. Creating a background like this was an easy way to pull in all of the inspiration colors! For the sentiment, I stamped the first part onto a sentiment banner and then used the Block Words to spell out B-E-S-T and the Classic Block Alpha dies to cut out P-A-P-A. I hope you like it! Check out the Ellen Hutson blog for more color board interpretations - click! 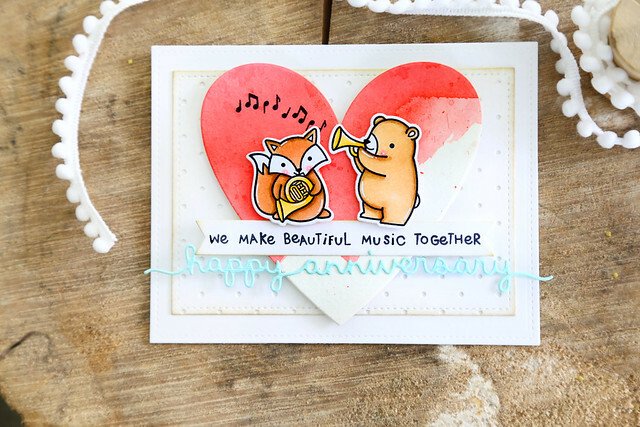 Ever since I laid eyes on the music-themed set, Critter Concert, I wished for this sentiment! I decided to make my own - ack! 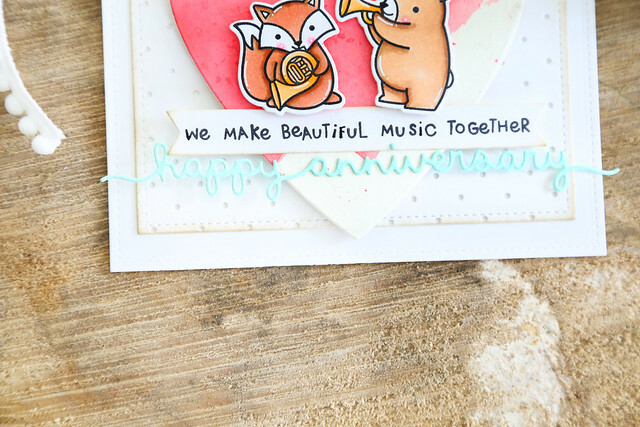 Because I was definitely using the Happy Anniversary border, I needed a smallish font, something that could fit into the banner flag that fit the die-cut-border's proportions. I found Plan On It: Spring Cleaning in my stash and went to work, stamping the letters out one at a time. All the letters I needed were in that set, save the F in beautiful - but I don't think you can tell that I drew it in myself. And to clarify, yes, I did cut up the letters in the Plan On It set, and I do that often with sentiments in any set. ha. I have no problems surgically giving my sets new life! 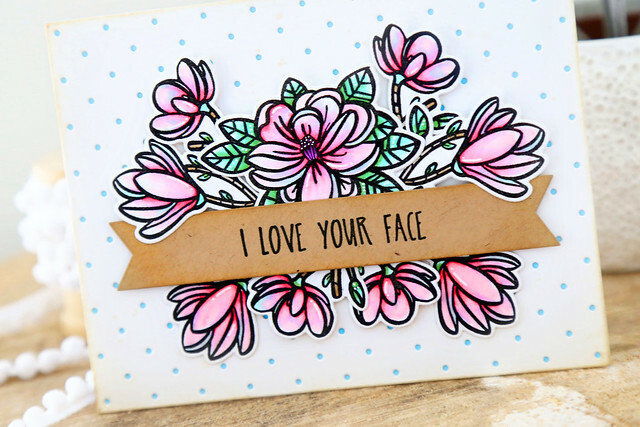 To build my card, I cut a heart and did some watercoloring on it in shades of pink. 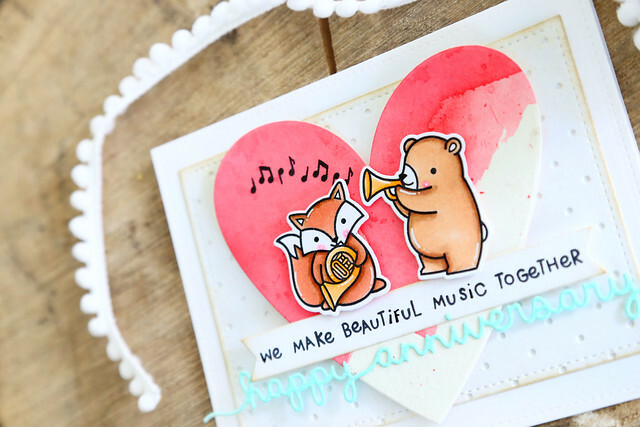 Then, I colored my band critters, stamped out extra music notes and added them to the heart along with the 2-part sentiment. 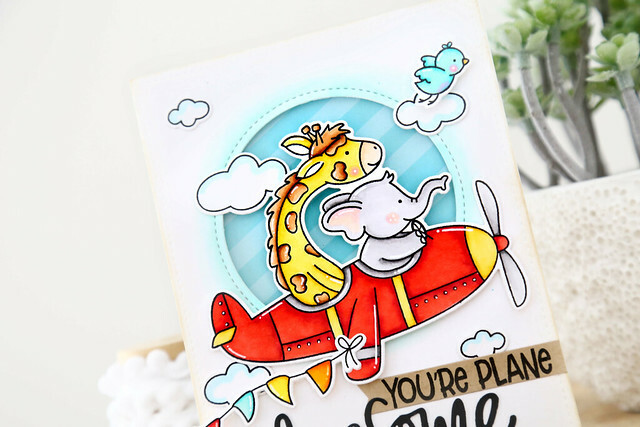 I layed those pieces onto a layer of Polka Dot coverplate (which I trimmed down using a rectangle die) and placed everything onto my white base. 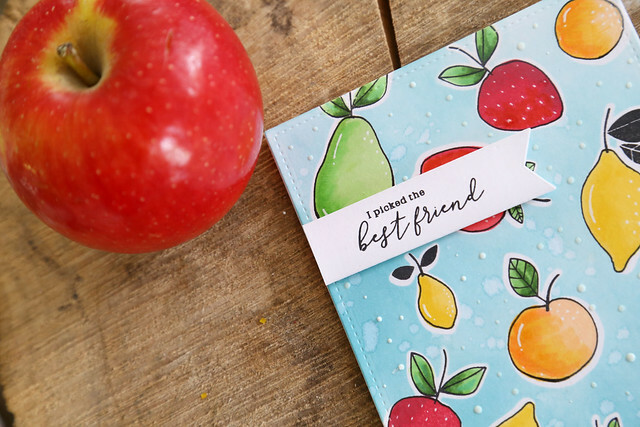 Lawn Fawn's June inspiration week is winding down, with only a few days left to enjoy. 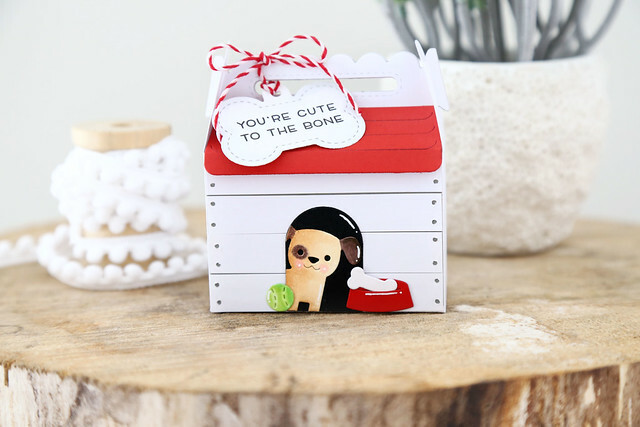 Today, we're showing off the Scalloped Treat Box Dog House Add-On. 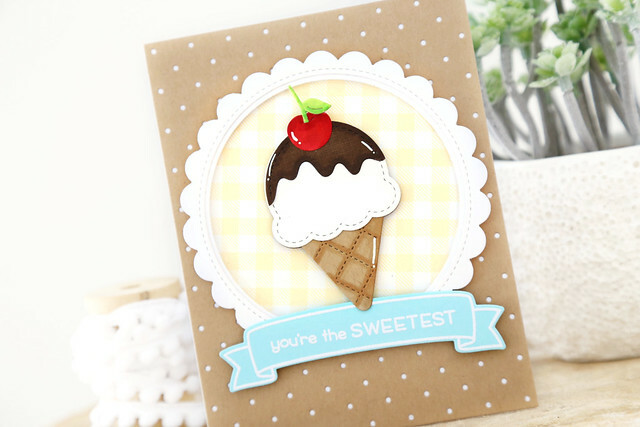 I love Lawn Fawn's Scalloped Treat Box! It's so versatile, and the fact that you can turn it into an adorable dog house with the add-on dies is so much fun. 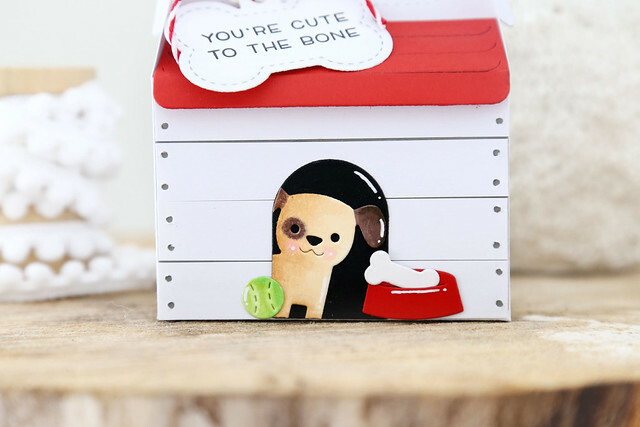 Wouldn't this box make the cutest favor for a dog-themed birthday party? I cut the treat box out of white cardstock, and then cut extra strips for the front. I used a tiny hole puncher to punch little "nail heads" so it could look like barnwood that was nailed down. Behind the holes, I colored the main box with a grey copic marker so that it could look like silver nail heads. Then, I cut out the pieces that came with the die: a red roof and doggy bowl, the big bone tag and smaller bone treat, as well as the dog and tennis ball. I stamped a sentiment from Happy Howloween onto the big tag and attached it with a red and white twine. I wanted to make it look like the puppy was peeking out from inside the dog house, so I chopped a little and stuck him onto the black doorway. I used a brown marker to darken his ears and color around his one eye. 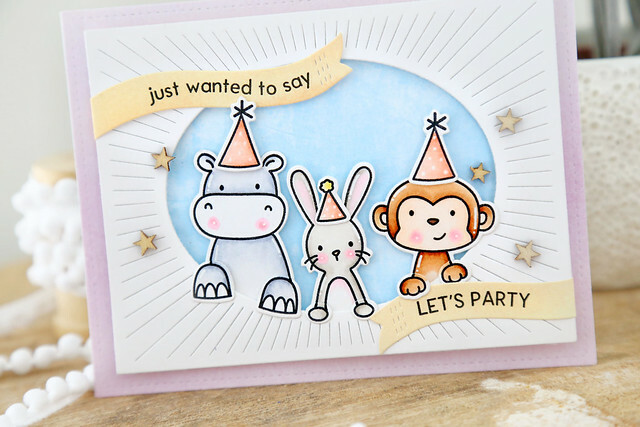 Just those little touches take a flat die-cut from boring to super cute. I used the original How You Bean? jar and the How You Bean? 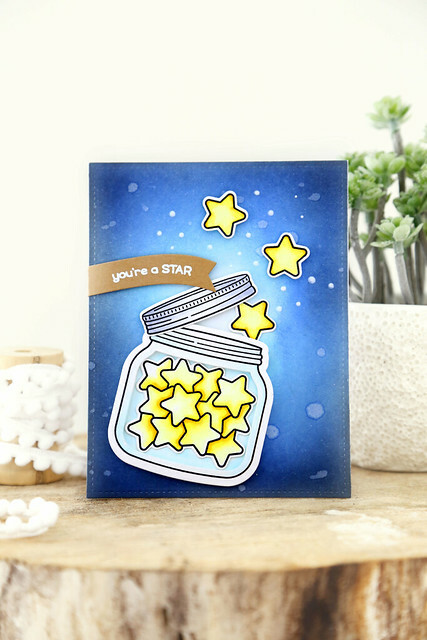 Shaker Add-On dies to create this jar full of stars! 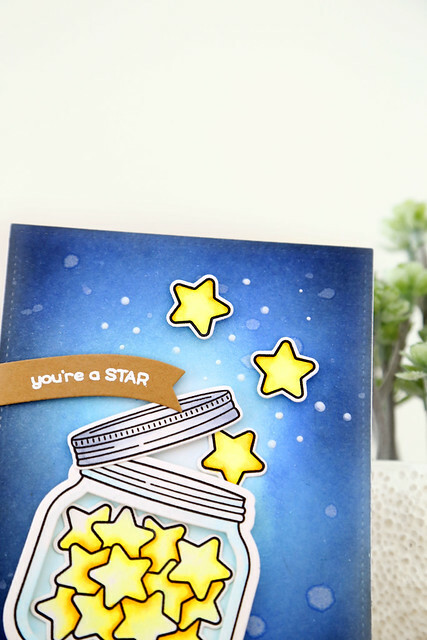 I wanted to make it look like the stars were floating out of the jar, and creating a light in the night sky. I blended some blue inks, and kept it darkest around the edges to achieve the look. 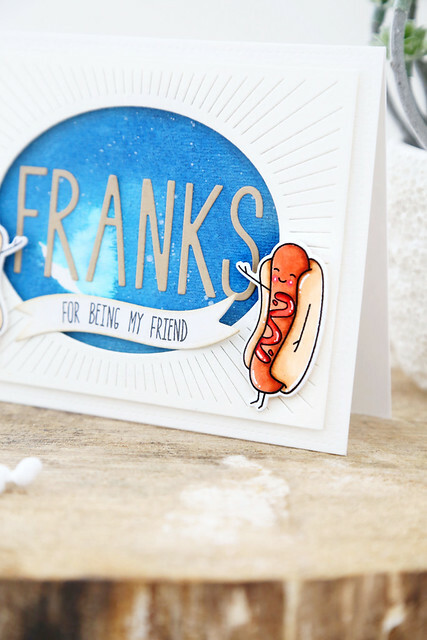 I heat-embossed the sentiment onto a kraft banner and added little white Nuvo drops around the floating stars to add to the dreamy effect. 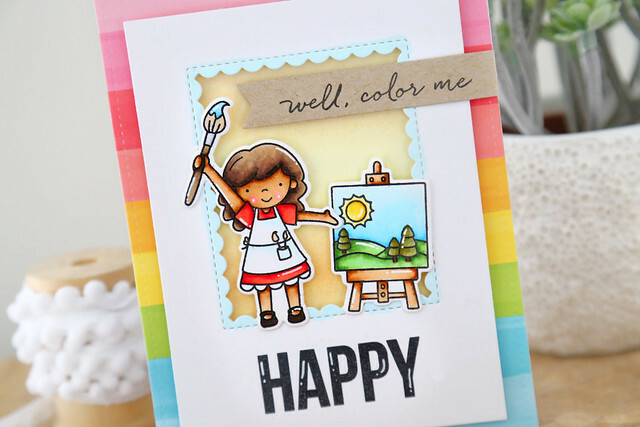 Welcome back to another day of this month's Lawn Fawn inspiration week! Today, we're showing off the Outside In Stitched Cloud Stackables and the Stitched Cloud Frames. I combined both on this sweet card. I grabbed a white cardstock panel, and did some soft ink blending. I then flicked some water over it to add a dreamy quality to the sponged color. I then cut into the panel with the cloud dies, and created a little shaker in the negative space. Down below, I created a little scene using the sweet ducklings from Rub-A-Dub-Dub. They are holding up a banner from Bannertastic. I love the little duck looking up at the clouds! 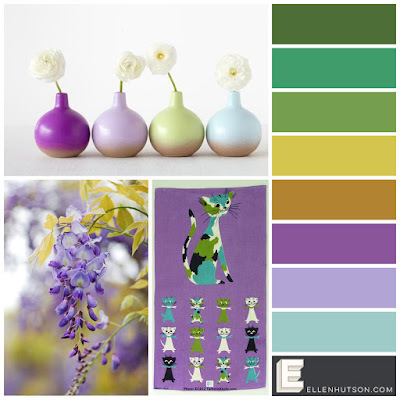 For day 2 of this month's Lawn Fawn inspiration week, we're heading to the shops! 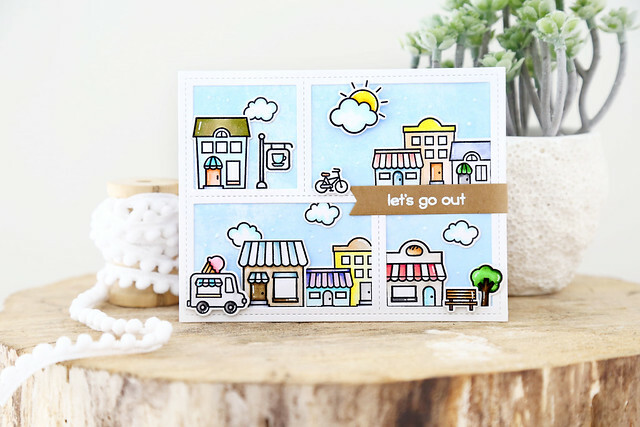 Village Shops is a cute set filled with little shops and things you'd find in a quaint town. It reminds me of some of the beach towns we've visited. I colored all of the shops with copic markers in all kinds of subtle colors. 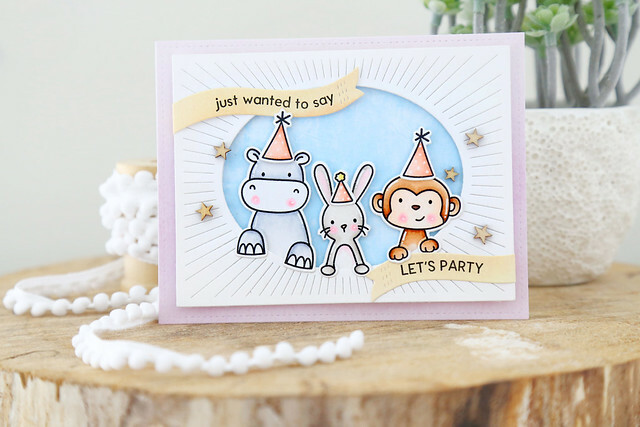 I set everything against a light blue paper sky and created little vignettes with the Peekaboo Backdrop die. I love the little ice cream truck! When we first moved into our house a few years ago, the kids and I heard what sounded like the sweet ding-ding of an ice cream truck on our street. We tore outside so fast, only to find it was a knife-sharpening truck. ha. I wasn't as disappointed as the kids were (mama needs her sharp knives!) but I totally wish we had ice cream trucks here! There's so much more to see on the LF blog this morning - click! I die-cut all of the pieces for my ice cream, complete with a chocolate drip and a cherry on top! I matted the cone with a piece of sunny yellow gingham paper, and framed it out with a Stitched Scalloped Circle Frame. 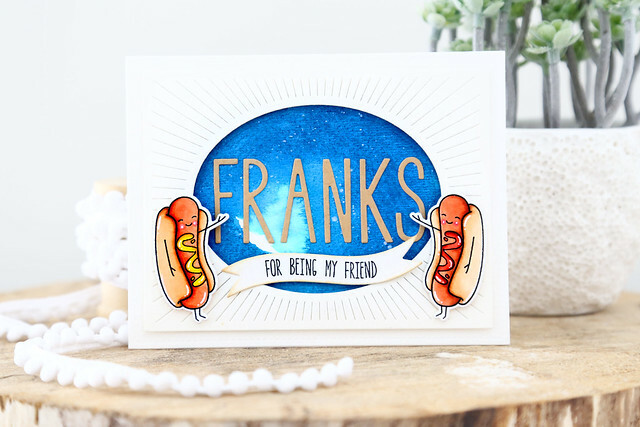 I heat-embossed the sentiment onto a piece of blue cardstock, and brought in more subtle pattern with the kraft-colored polka dot layer. I stamped and die-cut a trio of critters and their matching paws. Aren't they just the cutest? I colored them with copic markers, keeping the tones very light. For the hippo, I used C00, C01 and C3 to color the main body. For the bunny, I used W00, W1 and W3, and for the monkey I used E30, E31 and E34. I then used the Oval Burst die to frame them out and set them onto a blue background. I stamped the greeting on sentiment flags from the Wonky Stitches die set, and made them appear to be wrapping around the frame. The entire scene was set onto a piece of soft violet paper and adhered to a card base. I added a few wooden stars as a finishing touch. I hope you like what I've created! Thanks for stopping by! I giggle every time I stamp out these little guys! 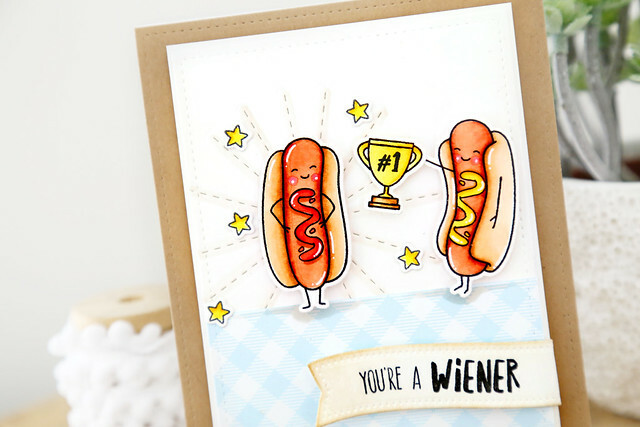 I stamped "#1" into the middle of the trophy, and made one hot dog present it to his sassy friend, who was obviously expecting the honor. ha. Just standing there, with his hands on his hips. He knew it. I added a Stitched Sunburst behind him so he'd shine even more. 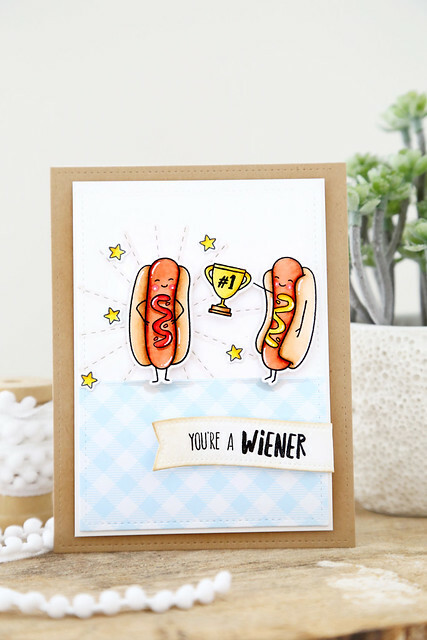 I grounded the hot dogs with a picnic-ready gingham patterned paper and added the sentiment to a sentiment flag. A few scattered stars finished things off. 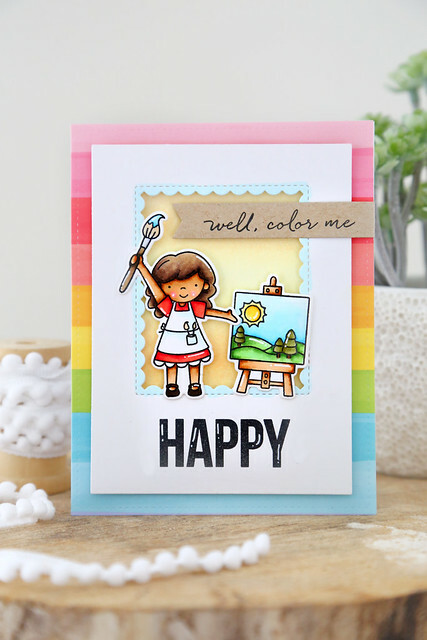 It's the final day of new product reveals for Neat and Tangled's June release week. We're showing off my second set for the month, Hot Dog, featuring a trio of hilarious characters. I watercolored a navy blue background, and cut Journaling Alpha letters out to spell F-R-A-N-K-S. How I know this stamp is for our generation and not the kids? 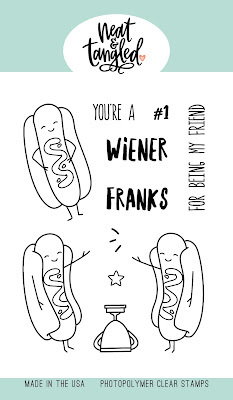 I had to explain the joke to my 13 year old, who had never heard a hot dog referred to as a frank before. But she giggled when I did, so there. 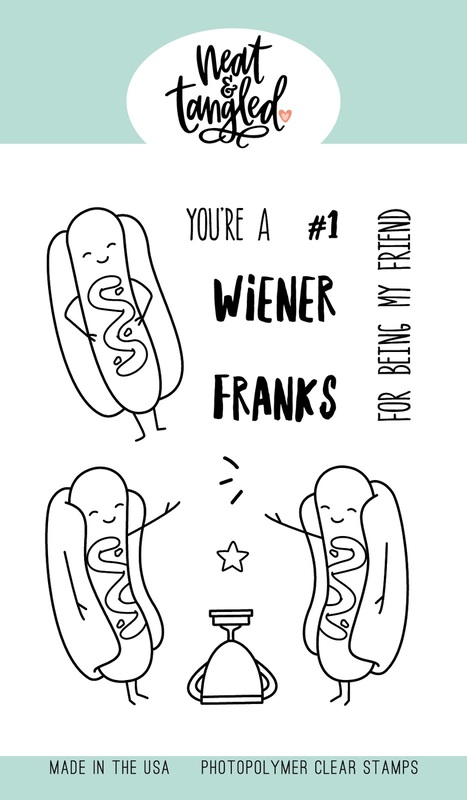 The wiener sentiment on the other hand, hahaha. That one is clearly for them. I colored the mirror-imaged dogs, one with a mustard topping and the other with ketchup. You know, variety. I gave them little rosy cheeks for added cuteness. I hope you find these little guys as charming as I do! Be sure to check out the Neat and Tangled blog this morning for Danielle's giveaway of this set, but before you go leave me a message here! Tomorrow morning, Danielle will announce the winner of a 25$ gift card to the NT store, on comment chosen from among the design team's blog posts this week. Welcome back to day 3 of this month's Neat and Tangled release week! 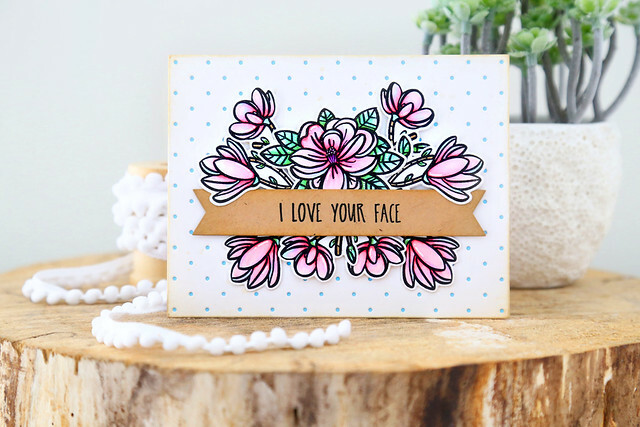 Today, we're showing off a sweet floral set designed by Danielle, called Magnolia. I colored a bunch of the floral images and clustered them around the sentiment strip. I stamped a sentiment from Friendly Florals. I wanted to make sure that the sentiment was simple in font and not too long, so that the flowers would really shine. The flowers themselves were colored using copic markers. I colored the flower centers in deeper pinks, and faded out the pink into a light violet color on the edges. 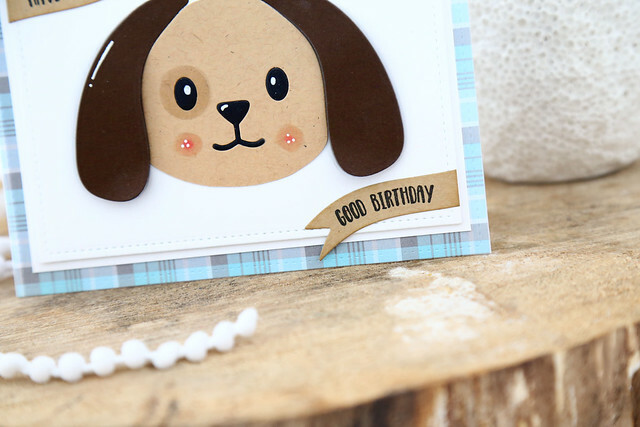 I used foam squares to adhere everything to a polka dot background (the die is by Lawn Fawn.) Underneath the polka dot layer, I hid a sheet of aqua cardstock. It's subtle, and adds a pop of color and interest to the base. I hope you like it! Before you go, leave me a comment! As always, Danielle will award one commenter a $25 gift card to the NT store at the end of the week, chosen from among the design team blogs this week. All week long, the Lawn Fawn design team is using products provided by Marvy to give you fresh inspiration! 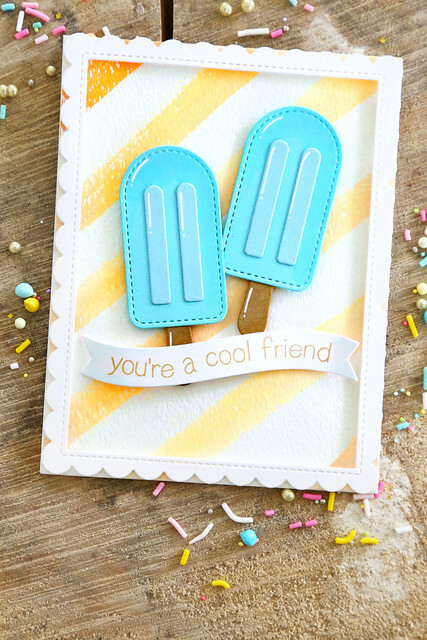 I used the I Scream You Scream popsicle dies for a card that is pure summer! I used the brush markers that Marvy sent over to create the striped background. By watering them down a bit, they have a fun watercolor look to them. 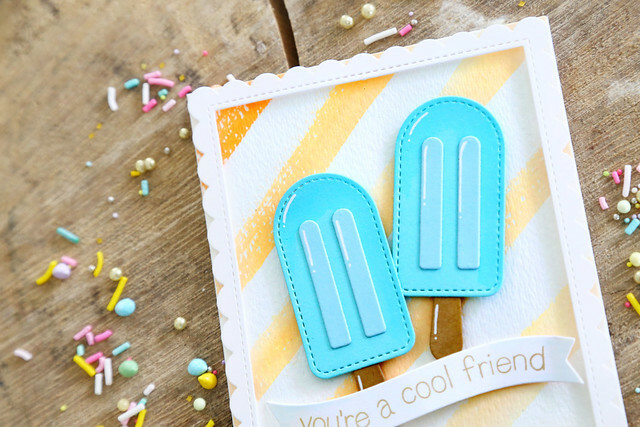 I also used a brush marker to create depth and shadowing on the popsicles themselves. 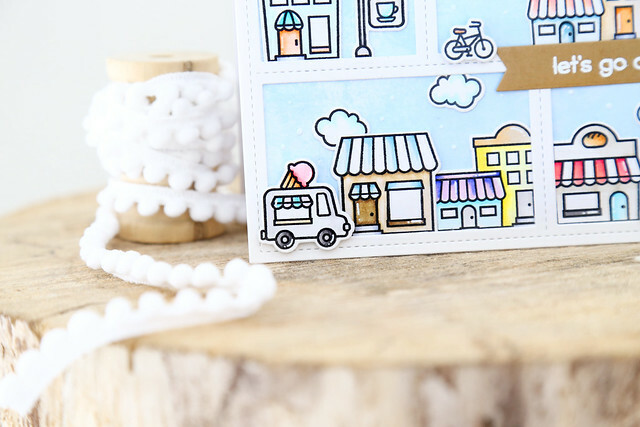 I reached back to an older set for the sentiment (Making Frosty Friends) and stamped it onto the wavy banner from the Shadow Box Card Ocean Add-On die set. 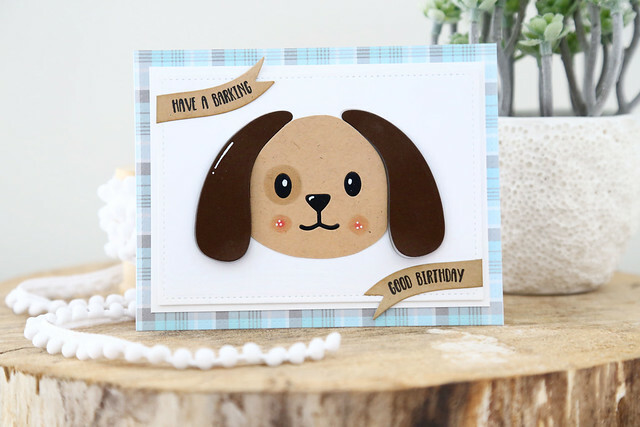 I'm here and on the Pinkfresh blog today, with a couple of cards to brighten your day. I just think it's so pretty and elegant, and a great set to use when you want a quick, but wow! card. I cut all of the elements out of white card-stock, and then used copic markers to add color to the flowers. I used R20 in the center of each flower and then pulled and softened the color out with R000. I used a white gel pen to create little flower stamen. I also used Copic markers (B00, B000 and B0000) to create a pool of water for the swan to swim in, and colored the sky a soft, buttery yellow. All of the swan pieces were colored with markers as well. I finished off by matting the swan dies onto a piece of patterned paper from the Escape the Ordinary paper pack. I started out by die-cutting fruit shapes onto sheets of post-it paper to create masks. I then laid the fruit onto a white piece of cardstock and rubbed Broken China distress oxide ink over the entire area. Before removing the masks, I spritzed water onto the background. Then, I stamped the coordinating fruit into the white spaces. I used 2 colors of ink per fruit to create a shaded look. The next step was to stamp in the coordinating stems and leaves. I really wanted this card to be whimsical, so I took a black pen and outlined each fruit. 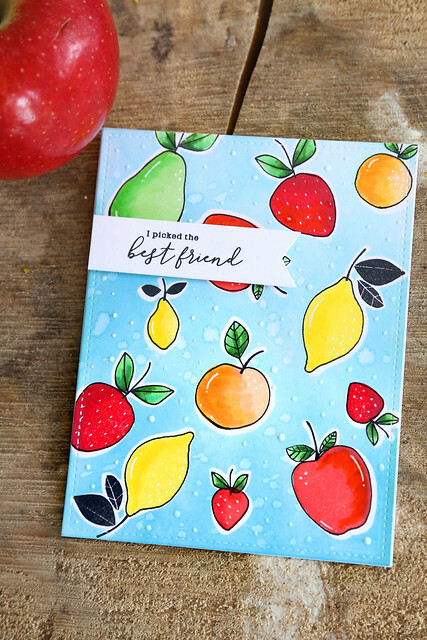 As a finishing touch, I added white gel pen accents to the fruit and the background. The sentiment is so perfect! I stamped it in black on a simple white banner flag. It stands out over the busy background. I hope you like what I've created for you today! Thanks for stopping by! Welcome to day 1 of this month's Neat and Tangled new releases! I'm thrilled to show off my newest set, So Fly. 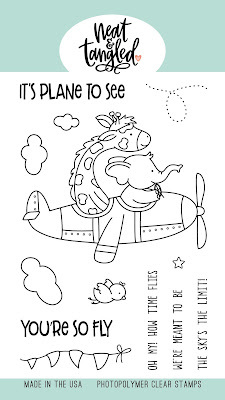 It features one main, large-scale image that fills up a card-front! I just love the curve of the giraffe's neck - he is my fave! 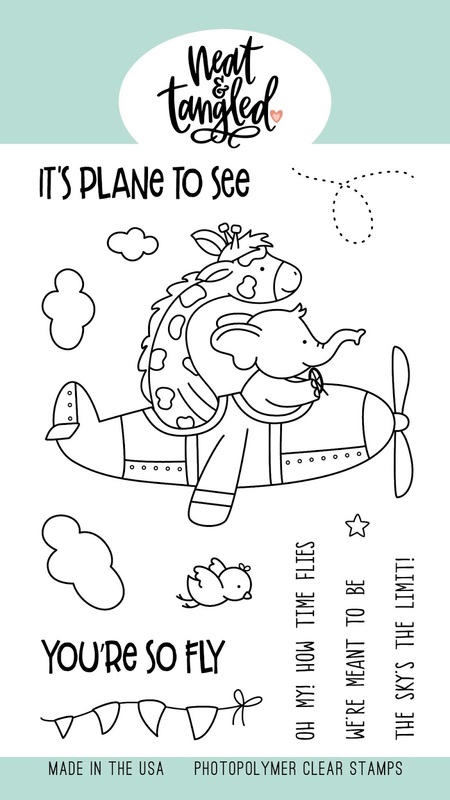 I colored the airplane a bright red, and set it against an inset blue sky. I die cut some clouds included in the set, as well as the flying bird and banner. 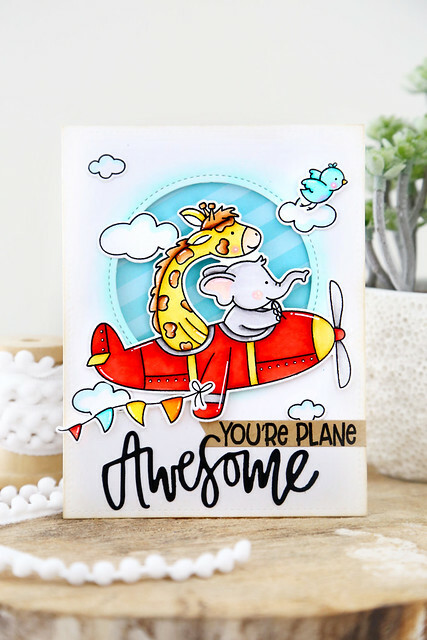 I created the custom sentiment ("you're plane") by combining the YOU'RE from one sentiment and the PLANE from the other. It's a simple thing, and I've stretched what this set can do! 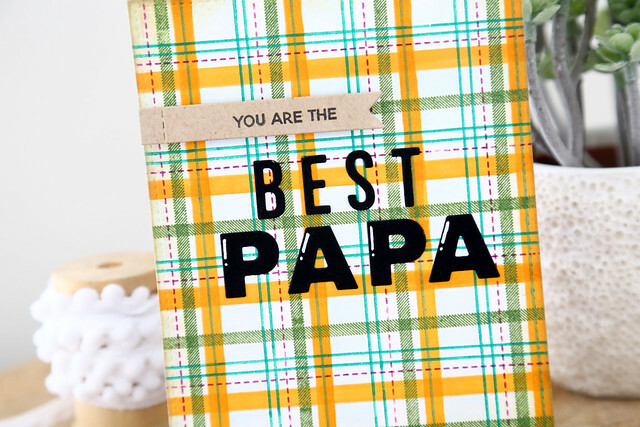 I used the Awesome die cut to finish off the sentiment in a graphic black that adds punch to the card. Let me know what you think in a comment below! As usual, there's a 25$ gift card up for grabs, chosen from among all of the design team's blog posts this week.